← May the Light of Joy Shine for Everyone! Homage to the Greatly Kind Lama! His Holiness 34th Menri Trizin Rinpoche. The Three Jewels are the infallible, constant place of refuge. The Mother and Son are the single refuge from the prevalence of the five degenerations*. Sidpé Gyalmo is the supreme mother, protector of the teachings. Greatly kind Lama, embodiment of all of the Victorious Ones, think of me! I pray single-pointedly that my wish for all obstacles to be removed will be perfectly accomplished! * The Five Degenerations: 1) Degeneration of time due to strife, 2) Degeneration of the life-span, 3) Degeneration of the body, mind and speech of sentient beings, 4) Degeneration of the afflictive emotions due to the five poisons, and 5) Degeneration of the view due to erroneous views and misconceptions. 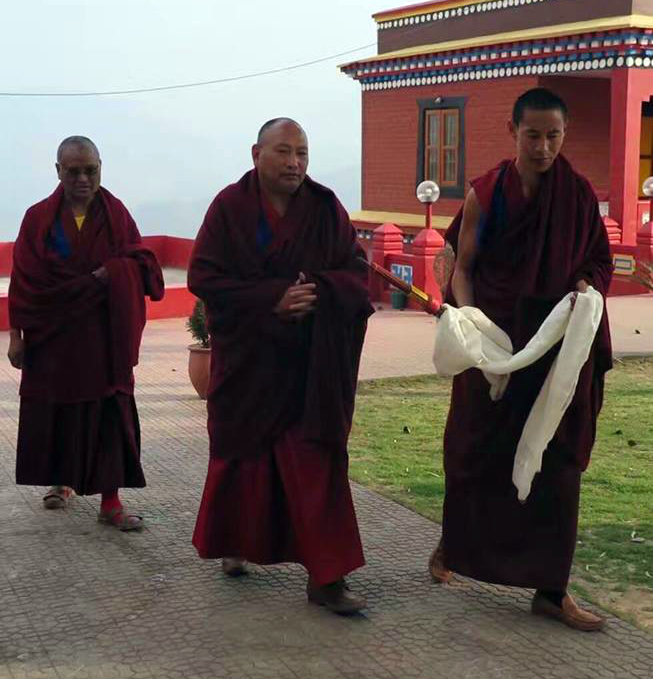 Posted on January 1, 2018, in Tibetan Lamas, Translation, Uncategorized. Bookmark the permalink. 1 Comment.